Every fall I see neutral colors and I LOVE it! 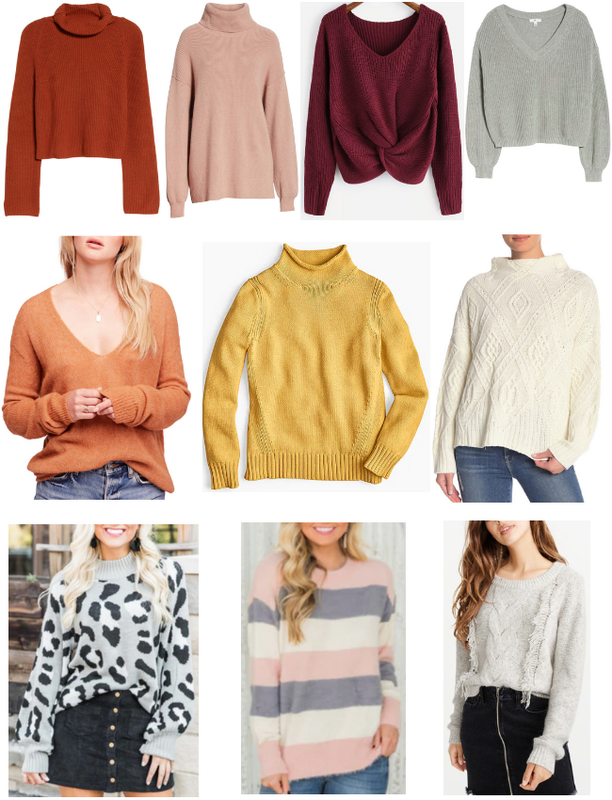 Neutral sweaters are such a classic staple in your wardrobe and they make for, in my opinion, some of the perfect fall outfits. Shades of orange, brown, and white are my favorite, however I also like to include reds, yellows and greens in the "neutral" fall color palette. If you can find the shade that's right for you, pair the sweater with a dark jean and booties you've got yourself a great look! I'm also loving turtlenecks and mock turtlenecks this season. The cut is flattering on almost everyone, and it just adds the slightest upgrade to your look without any extra effort. Speaking of effort, sweaters are SO easy and comfortable. Sweaters are like a nice warm and soft blanket that you get to wear without being judged. And who wouldn't want to wear a comfortable blanket everywhere if you could? You all know that I'm all for comfort and style combined, so sweaters are what I live in during the fall. Outside of the traditional neutrals or unpatterned sweaters, I do like to occasionally mix it up with a bold print or something more to make it stand out. If we're talking about patterns you can't go wrong with leopard print! The gray and black one above is perfect because it's still in that neutral category so you'll still be wearing the sweater without it wearing you. Stripes are another great option for patterns. I like this one because the colors are muted (and it's got my fave, blush pink!) and the stripes aren't overtaking the sweater. Stripes can definitely go wrong if the sizes are too small as they can make you look wider than you actually are, so sticking to larger to medium stripes is ideal. Outside of patterns, the trend that seems to be going around these past few years has been extra embellishments. Whether it be tassels, pom poms, pearls, or jewels, these can be cute ways to upgrade the traditional sweater. I only included one sweater with embellishments since everyone and their mother has been a little overboard with pompoms and such lately! Currently digging the J crew mustard one... but not sure If my skin tone can pull that off, lol. I've been eyeing up that front knot sweater! I love all of these!! LOVE the twist one at the top. Perfect color for fall too! These all look so comfy. I'm loving that grey one at the top. Such cute options though. I do love sweaters and Fall fashion. I'm in love with third from the left on the top row and the first on the second row. Just have been really feeling the V neck sweater lately over the turtle neck!! Oh and love all the colors they just scream comfy cozy fall!! I love each of these sweaters. Fall fashion is the best! My favorite is that v-neck twist sweater. So pretty! I love that twist front sweater. So cute!! That front knot sweater!! I love everything about it!